The newly elected Chief Minister of Karnataka, Sri Siddaramaiah announced that 97 lakh BPL and Antyodaya cardholders in the state would receive 30 Kg of rice at Rs 1 per kg from the 1st of June. This date, though subsequently revised, poses more challenges than that of the procurement and distribution of nearly 3 lakh metric tons of rice. If the Chief Minister is serious about the implementation of the scheme, he first needs to understand the problems on hand and set them right before any meaningful implementation can begin. 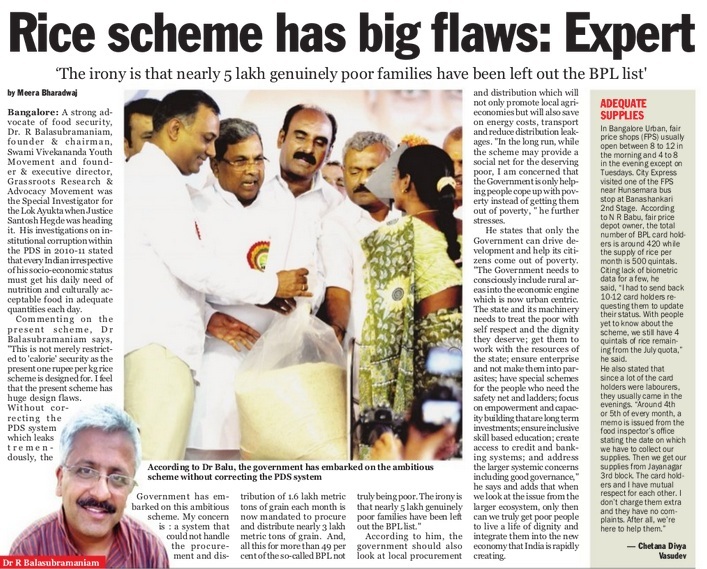 It is now nearly 3 years since the then Lok Ayukta Justice Santosh Hegde had asked me to investigate the corruption and mal-administration in the Public Distribution System of Karnataka. After having traveled around the state and studying the entire system as it exists today, my report was submitted to the Government through the Lok Ayukta in July 2011. What I had then discovered was indeed shocking and was an example of how a well-meaning public service scheme could be reduced to being highly inefficient and corrupt. The state has messed up the process of identifying the ‘real poor’ and Karnataka today has the dubious distinction of having nearly 80% of its population declared to be below the poverty line. While the Government of India insists that only 31.29 lakh of the total 120 lakh families in the state are below the poverty line, the state Government has managed to issue BPL cards to nearly 97 lakh people. Apart from 30 lakh ghost cards that were in circulation, the Lok Ayukta investigation in 2010-11, which went by the State’s own poverty indicators showed a huge inclusion error of 49% while nearly 5% of the real poor were actually excluded from the BPL list. The annual economic loss due to leakages and corruption in Karnataka’s PDS that was computed based on the data and information received then was around Rs 1737.6 crore. While loses due to over allotment was around 38%, the distribution leakage loss was 37%. Losses in transportation, stolen subsidy and other losses accounted for the rest. The Department of Food and Civil Supplies is mandated to manage the existing program each month through an elaborate system of procurement, storage, transport and retail distribution through nearly 20,000 Fair Price Shops located all across the state. The department is inadequately staffed especially at the lower levels. Usually one food inspector located in the Tahsildar’s office is expected to oversee and monitor close 100-150 Fair Price Shops. One glance at the job description of the food inspector which mandates him to do cursory and detailed inspections of a certain number of Fair Price Shops in his jurisdiction will itself show how impossible his task is. This has naturally resulted in poor or no monitoring of both the wholesale and retail outlets at the grassroot level. Fair Price Shops are the ‘last mile’ in the distribution chain and are the face of the scheme. Apart from problems of billing and stock disclosure, they are beset with other issues as well. Despite Supreme Court’s orders, these shops function for a few hours for a mere 3-4 days each month and most shopkeepers complain that they can ill-afford to keep them open throughout the month for the kind of paltry commission given to them. The Fair Price Shops are treated as political doles and are designed to be economically unviable. This gives the shop owners the rationale and incentive to resort to pilfering and short-changing their customers. Now, these very shops will be the platform through which nearly 3 lakh metric tons of food grains will be distributed every month. Apart from the systemic issues involved, one also needs to ask the critical question of why the Government looking at supplying 30 kg of rice alone. How can such a diet rich in mere ‘calories’ ensure food security? What about other culturally acceptable foods like Ragi in the old Mysore region and Jowar in North Karnataka? Why does the Government think it prudent to procure rice either from the Government of India or the commodities market or from distant open markets and then transport them at a high financial and energy cost throughout the state? Will not a local procurement and distribution network stimulate local economies, reduce wasteful energy consumption on transport and also reduce the risk of leakages at multiple levels? Today we are seeing farmers tending to grow less and less of the staple crops when it is both cheap and convenient to depend on the local Fair Price Shops to meet your food needs. The result is that culturally acceptable traditional food grains are both disappearing and becoming more expensive to consume. The Government cannot merely consider calorie consumption but should also internalize that nutrition security of people has to be addressed keeping in mind local cultures and tastes. What does the Government need to do now? 1. Universalize the Public Distribution System. The fact that nearly 80% of the state’s population are benefiting from the PDS shows that the scheme is ‘quasi-universal’ already. In the light of this, the state can consider universalizing the PDS system similar to Tamil Nadu and allow a process of self-selection in people accessing the scheme. 2. Define a new and realistic set of poverty indicators and prepare a fresh list of BPL families in the event of continuing with the targeted system. 3. Build a robust and effective monitoring mechanism where Social Accountability and Citizens Engagement processes are the norm rather than the exception. 4. Reconsider distribution of only rice as part of the scheme and include other locally grown, traditional and culturally acceptable grains like Ragi and Jowar. 5. Begin local procurement and distribution of food grains. Direct procurement will also result in stimulating micro-economies and benefit lakhs of farmers across the state. 6. Implement the recommendations made by earlier committees like the Wadhwa Commission, the guidelines of the Supreme Court and the Lok Ayukta report of 2011. 7. Enhance the commission given to FPS, along with overhauling the retailing mechanism. 8. Introduce a technology-enabled system right from the point of procurement to the end point of retailing. This can include weigh bridges at wholesale godowns, Wide Area Networks (WAN) linking all points in the entire chain with computerized inventory management systems, GPS enabled trucks, Point of Sale machines at the FPS linked to the WAN system, smart cards for the beneficiaries, etc. The State Government should realize that unless a systematic and sustained effort is made to build a responsive, responsible and effective delivery mechanism, its desire to provide food security to the people of Karnataka will only remain a dream and a short-sighted political tool. The enthusiasm of the state should not be restricted to merely sourcing markets and ensuring procurement, but should also focus on correcting the flaws in the existing system. Otherwise the program may end up as another ‘cash cow’ for a corrupt and inefficient system to milk at the expense of the common man. Previous Article (77) Time indeed flies!